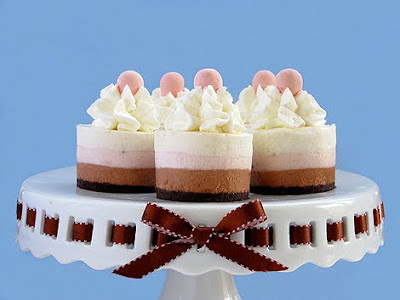 These Neopolitan Mini Cheesecakes from Bakers Royale are just adorable! And the fact that they are made with no-bake cheesecake makes them even better. She hasn't posted the recipe yet, but has promised it will be soon. Bakers Royale is a new find of mine. She has posted pictures and recipes for lots of delicious looking (and I'm sure tasting) desserts. My taste buds are going crazy for some Salted Caramel Cheesecake Cups or these Banana Caramel Cupcakes or maybe Croquembouche Cupcakes (I'm not even sure what these are, but I want to try! ).